Syracuse, NY, January 28, 2016 – The U.S. Coast Guard Auxiliary and New York Sea Grant have announced a change in the Young Boater Safety Certificate training course offered annually at the Central New York Boat Show. For 2016, the free program that certifies youth ages 10 to 17 to legally operate a motorized boat or watercraft alone on New York waters will be offered entirely on one day, Saturday, February 20, from 9am to 5pm, at the New York State Fairgrounds in Syracuse, NY. Youth must successfully complete the 8-hour training and a proctored exam to receive certification. This training was previously offered on two days at the show. Pre-registration is required for the limited space seating for the course that will be taught by U.S. Coast Guard Auxiliary Flotilla 21 personnel. New York Sea Grant is taking registrations by phone at 315-312-3042. Each youth registering for the Young Boater safety course will receive three free admission passes into the 2016 show that is the largest and oldest boat show in New York. Participants are asked to provide for their own lunch. The 2016 Central New York Boat Show hours are 1-9 pm on Thursday, February 18, 1-9pm and runs from 1-9pm on Friday, February 19, 10am-9pm on Saturday, February 20, and 10am-5pm on Sunday, February 21 in three buildings at the NYS Fairgrounds with more than 500 boats of all styles, water recreation equipment; marine accessories; boating and fishing guides; yacht clubs; and exhibits by waterfront destinations, tourism organizations, and local, state and federal law enforcement agencies. 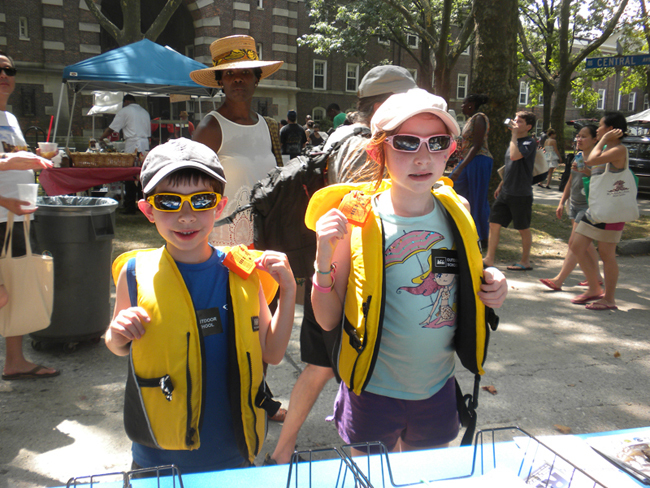 The award-winning New York Sea Grant Discover Clean & Safe Boating program will be at the show with a uniquely-styled boat for its 2016 campaign with information and demonstrations on life jacket and boating safety, and voluntary watercraft inspection to help slow the spread of aquatic invasive species. Show admission is $10 per person, 13 and younger free. Free parking and shuttle are provided. Learn more at www.cnyboatshow.com. New York Sea Grant maintains Great Lakes offices at SUNY Buffalo, the Wayne County Cooperative Extension office in Newark and at SUNY Oswego. For updates on Sea Grant activities: www.nyseagrant.org has RSS, Facebook, Twitter, and YouTube links. NYSG also offers a free e-list sign up via www.nyseagrant.org/coastlines for its flagship publication, NY Coastlines/Currents, which is published several times a year.